Onkyo HT-BD3315 review | What Hi-Fi? In this instance, for 'home cinema in a box' read either 'separate components at a special price' or 'home cinema in several boxes'. The Onkyo HT-BD3315 consists of HT-R380 multichannel receiver, BD-SP308 Blu-ray player and HTP-338 5.1 speaker package, and its pros are almost exactly equal to its cons when judged against more integrated systems. A system like this occupies a fair bit more space than your usual all-in-one, though, and better-integrated systems don't show up with two remote controls. Decoding the DTS-HD Master Audio soundtrack to the ferocious Ninja Assassin, the Onkyo establishes a secure, relatively expansive soundstage and moves the effects around with speed and precision. Images enjoy good levels of detail, a nicely balanced colour palette and convincing skin-tones. For all its general poise, though, the Blu-ray player is sometimes panicked by motion and doesn't offer quite the insight into or differentiation of black tones that some other affordable standalone players can muster. 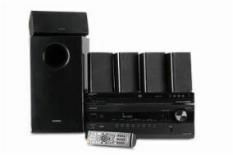 The HT-BD3315's biggest drawback, however, is its speaker system. For all the good work the amp does, it can't do much about the thin voices with which the speakers sing. There's a coarse and gauzy quality to the top of the frequency range; and the subwoofer seems, at best, on nodding terms with its five partners. To be fair, though, that's a failing of almost every all-in-one system we've heard. There's an extremely competent system struggling to get out here, but while it's saddled with these speakers it's never going to compete for top honours.